All games aside, The Great Escape is first & foremost, an absolutely gorgeous piece of nature. 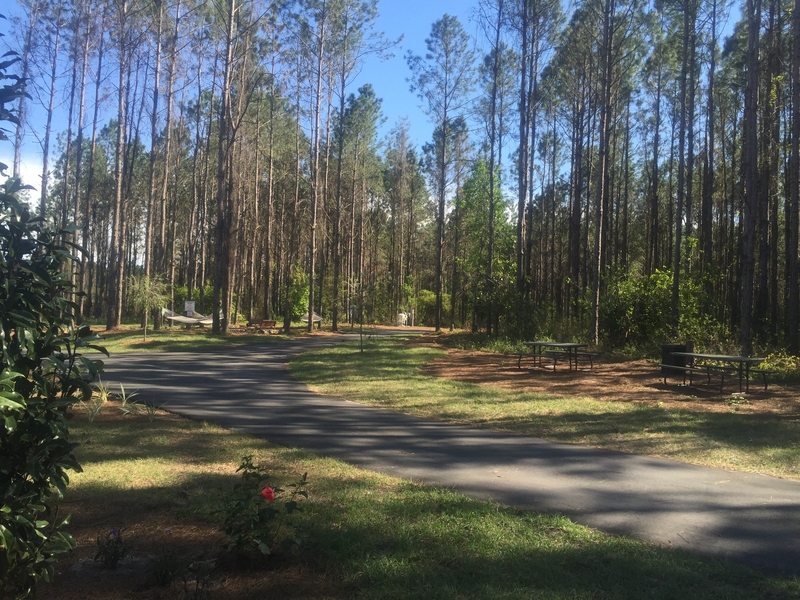 Studded with countless mature trees and accented by our own hammocks, picnic tables, and sitting areas, you'll find plenty of places to 'get away from it all' and enjoy silence & serenity. 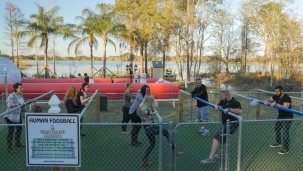 Click Here To Check The Great Escape Lakeside's Availability! Get Your Game Face On! These Are just a few of our OTHER amazing amenities! Grab hold of the sliders and use teamwork to score a goal! Read more..
Lite Up Your Family's Life! 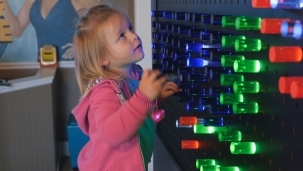 Display your own artistic creations on our Giant Lite Brite wall! 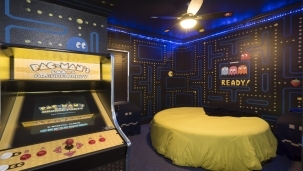 Read more..
Every room and closet of Great Escape provides a 360 degree interactive gaming experience. Read more.. Play Pac-Man on a stand-up arcade machine or enjoy classic video games on an Atari 2600 or Intellivision! Read more.. The huge pool features a lazy river and 2 waterslides. Read more.. 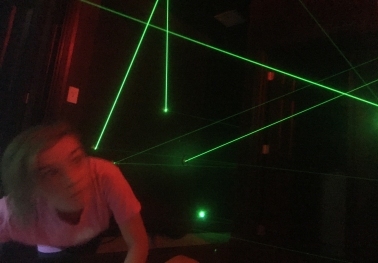 Duck under & climb over actual lasers in a high-tech race against time! Read more.. 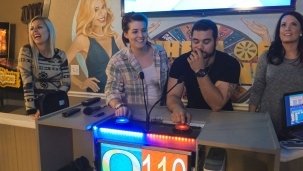 Play Wheel of Fortune, Jeopardy, & other hit game shows LIVE in our buzzer-operated interactive studio! Read more.. Enjoy classic pinball, stand-up arcade games, billiards, boomerang air hockey, X-box, PS, Wii, & more! Read more..
Dance the night away, sing karaoke, and play high tech games in The Great Escape's family night club! Read more.. 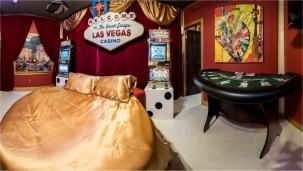 Play real slot machines, use a full-sized blacjack table, and more in the Casino Games/Royal Flush suite. Read more.. Solve A Mystery... To Escape! You'll have 60 minutes to try to beat the world's only residential Escape Room--based on CLUE. Read more.. 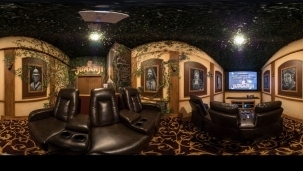 Experience our state-of-the-art Jumanji theater. Recline in luxury seats & watch Hollywood hits in comfort. Read more.. Play the biggest hit versions of Scrabble and try to unscramble an encoded wall message! Read more.. Challenge yourself with the World's Largest Word Search and other mind-bending puzzles. Read more..
Beautiful Lake Walsh is quiet, serene, & filled with bass! Read more.. 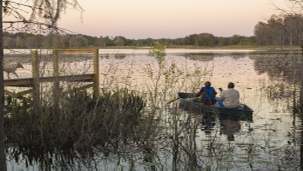 Explore our peaceful,natural habitat by kayak, canoe, or pedal boat. Read more.. 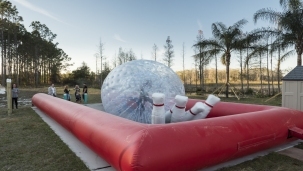 Roll into giant cushioned pins in a game of human bowling! You can even keep score! Read more.. 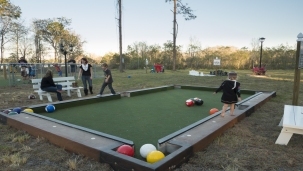 It's a huge concrete pool table in which players KICK giant soccer billiard balls into the pockets! Read more.. Copyright . All rights reserved. 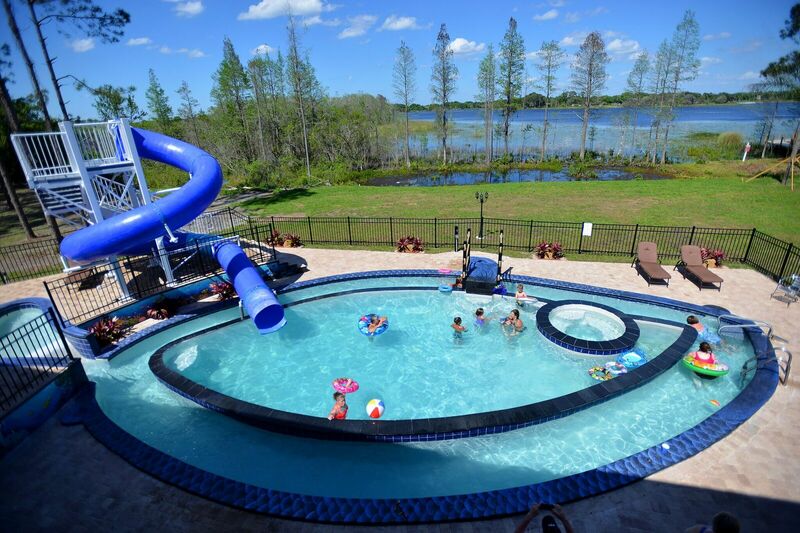 The Great Escape Lakeside is a Private 10 Acre, 13 Bedroom Estate/Vacation Rental Just Outside Of Orlando, Florida. 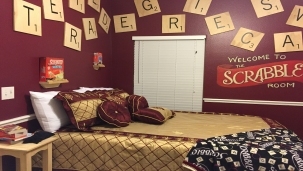 We have no affiliation with the makers of any games that we've used to artistically decorate our rooms. First class, SIX star service is provided to all guests during their stay. The owners reserve the right to refuse to book any guest who gives them reason to believe that they will be potentially destructive to the property. Bookings are on a first come, first serve basis. The Great Escape is in a secure, gated location with an excellent reputation. 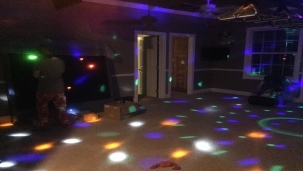 However, neither the owner, nor Orlando Area Luxury Rentals, LLC are responsible for any damage to a guest's personal property nor for any injury that occurs during any guest's stay. Full terms of booking can be viewed in our standard rental agreement. If you have ANY questions, please click here to let us know or call 1-352-978-8730.